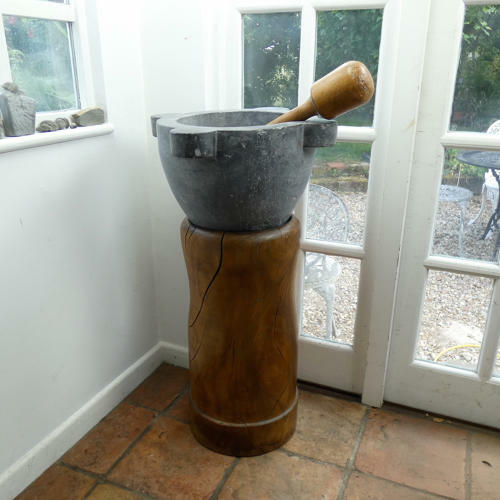 A fantastic, 18th century, court kitchen, pestle and mortar on stand. The stand is turned from a single, solid piece of elm and it measures 67cm. (26 3/8in) high by 35.5cm. (14in) diameter at its widest part. There are various splits in the wood but this is inevitable due to the density and age of the piece. It has excellent colour and patination. The mortar is a dark grey marble and it measures 51.5cm (20 1/4in) across by 28cm. (11in) high. There are very minor chips to the marble, on the rim of the piece. There is a recess in the top of the stand and the mortar sits down into it. The total height, when the two pieces are together is 92.5cm. (36 1/2in). The pestle is made from boxwood and measures 50cm. (19 3/4in) long by 9.5cm. (3 3/4in) diameter at its widest part. There is minor cracking to the wood but the colour and patination is excellent. Overall, this is an exceptional item and it would make a very impressive feature in a large kitchen. Delivery or shipping on application.